AS Roma have confirmed their intention to leave their home at the Stadio Olimpico and open a new stadium, currently under the working title of the Stadio della Roma. The stadium will be state-of-the-art, with a 52,000-seat capacity and with room for expansion to 60,000. The stadium would have several obvious advantages over the larger Stadio Olimpico, which Roma have called home, along with city rivals Lazio, since the 1953-54 season. The development of this iconic stadium is a central part of Roma’ s new ownership group’s vision and strategy for the future of the club and the re-emergence of the club as a force on the global football stage. “We have worked exceptionally hard over the past two years and particularly in recent months in collaboration with Mayor Marino and his administration in developing this stadium project for AS Roma, the City of Rome and our great fans” said Mr Pallotta, United States based Chairman of A.S. Roma. “The city and fans deserve this a world class stadium. We are confident the Stadio della Roma will be among the best in the world and a key driver for the club’s continued success ” he added. 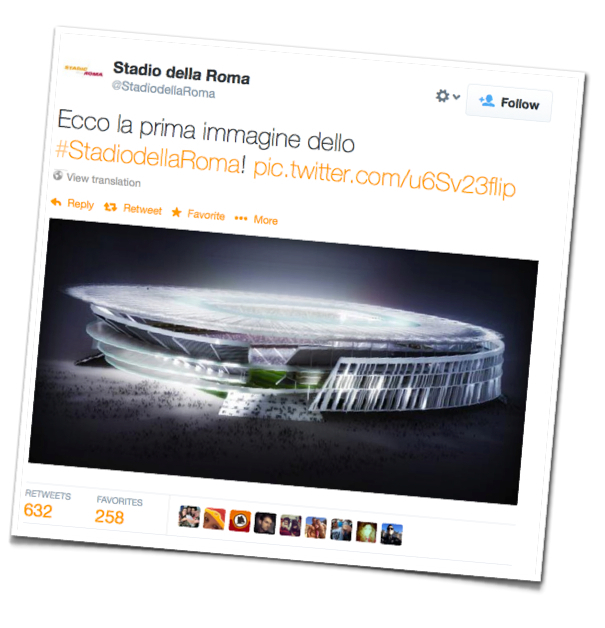 Share your thoughts on Twitter – what does it mean for Roma, is this the first concrete step towards perpetual glory? Eric Solem, Head of Ticketing for AS Roma, will be attending TheStadiumBusiness Summit 2014. Meet him and other leaders in the stadium industry at Wembley this June!